The boxes are of different size because there is a bigger gap for the luggage rack on the exhaust side. i've chosen the Touratec Universal Adapter for 44€ (04.2011) each (1 per box). Därr sells the pair for 13€ (05.2011). The last thing i did with the boxes, was to tape the inner surface. The blue one is an Ortlieb "Rack-Pack Sailing-Line" 89l (70€ 04.2011). Sleeping bag, sleeping pad, and all my cloth go into this. The sleeping mat is a MERU Down Comfort 800, the thing i really like about it is that they used cotton for the inner material. I was pretty lucky when i bought it, payed 100€ for the last older 2008 model, normally its priced at 150€ (05.2011). 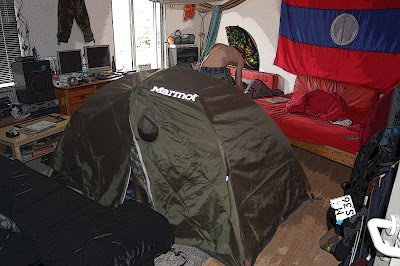 The sleeping pad is a self-inflating Thermarest "Trail pro Large", luxury 110€ (in April 2011), but it's really comfortable! The pack size is quite big, but i should have enough space. This nice little thing is a Samsung NC10 10" Netbook, got it a while ago from my parents. Don't know what they paid for it, but i guess around 350€. To make it more travel capable and a bit faster, i bought an Intel SSD (80GB) and a 2GB RAM (160€ total). The wakeuptime (from standby) is around 15sec now, nice!